I agree that the center of any new business model is a value proposition – but the reality is that there is a very mixed understanding of what that truly is. In particular, I’d like to suggest that figuring out what value you want to create FIRST, without identifying in advance the value needed/demanded from your audience is putting the cart before the horse. Many a technology start-up has burned through their cash and shut their doors because they had a value proposition that spoke to the offer they wanted to sell, and not to what the buyer needed and was willing to buy. It’s the old “build it and they will come” theory which simply doesn’t work. The value that the audience needs and desires comes before anything else in crafting a value proposition. Then it should be translated into a modular platform that defines the value the audience is looking for, the specific offer(s) your organization delivers on the desired value, and finally, you need to define 1 or 2 rock solid differentiators that are quantifiable (with proof). Smart start-ups will verticalize the value proposition into their different market segments as soon as possible so that it speaks in industry buyer language to specific industry issues, objectives, challenges. So I agree that business model central area is the Value Proposition. But it actually hinges on a clear, well-articulated, customer-focused value proposition that is tailored by market and by audience. Without it, the rest of the your business model canvas ends up being just busy work. My best start-up advice is this: start with customer, start with the customer, start with the customer. Haven’t got a customer yet? Vision who they should be – and work to define the value proposition they care enough to spend money on – then define/refine the offering. Don’t waste your time and theirs on a cool idea that chases customers, rather than engages them up front. So, what do you think is the rock that start-ups should be built upon? 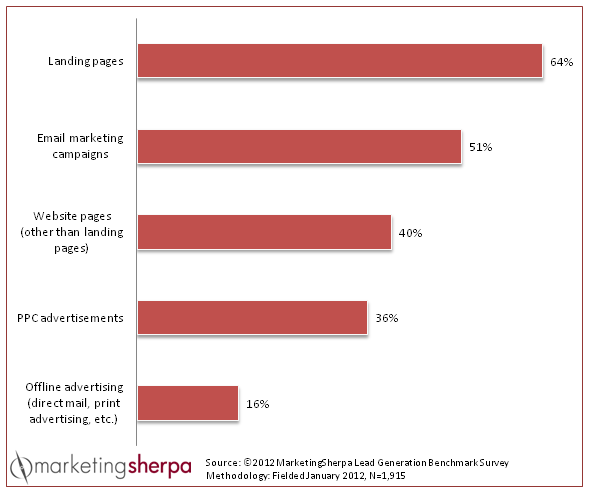 Marketing Sherpa just republished a chart that outlined some research on how organizations test this key marketing asset. One area that they overlooked entirely is testing by conducting live interviews with your existing customers about the value proposition. This kind of conversation with customers can provide important information on what resonates, what is missing, what proof points are needed, how it is perceived comparatively with your competition, among other vital attributes. While online testing via landing pages, email, and other electronic options provides good data – nothing replaces live customer feedback. In crafting messaging that brings the value proposition to life, a customer voice is essential. Here’s the whole article. What do you think? In a recent article I wrote called Time for a Value Proposition Reality Check, I discussed the three most common types of value propositions, including the most common, and least effective, type, which I designated as the “Me, Me, Me” version. You know the kind…one that only talks about your own company and products. Sadly enough, this is employed by businesses in the vast majority of cases. Why is it used so often, then? Because it’s the easiest one to construct, which may not be the best reason for the choice. So here we are. You need to buy a product (or service), and I am trying to get you to buy mine. You have choices. You can buy my product, or you can buy my competitor’s product. I want you to buy mine, so in order to get you to do so, I am going to tell you all the wonderful things I can think of about my product, and my company, and the outstanding people that I employ in order to create this great product that I want you to buy. Now, how could you NOT want to buy my product? You now know how great it is, because I told you so. We can’t imagine anyone else having nearly as great a product, because they don’t have this great a company, and they can’t have the best people because I told you, WE have the best people. So, how many of our products do you want, hmmm? While this may seem a bit sarcastic – the reality is that many value propositions do, in fact, include this type of pitch. Obviously, the problem here is that it does not take into consideration any of the prospective customers’ needs, feelings, experiences, or knowledge. We are not selling in the abstract here, nor are we selling to Generic Customers. We are selling to individuals, each as different as each of the “great people” we’ve employed. Therefore, talking only about ourselves is not going to sell the product unless we related that greatness to what the prospective customer is seeking. And in order to know what that is, we have to get to know the prospective customer, and see the world through his/her eyes. The “Me, Me, Me” value proposition sees the world through the business’ eyes. That works for a Friday afternoon internal company pep rally, but does very little to entice an educated customer. This customer wants to know, given specific needs and particular circumstances, why this product is the right choice. Everything else, frankly, is irrelevant.